Columbus Grove is part of master planned development community in the City of Irvine. It includes Columbus Square, Tustin Field I and Tustin Field II. Part of Columbus Grove falls within the City of Irvine and City of Tustin. There will be Expecting to build massive amount of more residences, commercial and retail stores in the future. Columbus Grove offers ten different residences and floor plans mainly of single family homes, paired homes with one common wall between two homes and attached townhomes. The Columbus Grove community has many different neighborhoods and floor plans available. Here is a quick guide to the Savannah, Lantana and Kingston neighborhoods within Columbus Grove. Residence One - Prices starts from mid $400,000 and their size is 1,056 Square Feet, 2 Bedrooms, 2 Bathrooms with one car garage. Residence Two - Is a three story townhome starting high $400,000's and their size is 1,209 Square Feet, 2 Bedrooms, 2.5 Bathrooms and two car garage. Residence Three- Prices start from the low $500,000, 1,310 Square Feet, 1 Bedroom, 1.5 Bathroom and one car garage. Residence Four - Home prices starting low $500,000, 1,316 Square Feet, 3 Bedrooms, 3 Bathrooms and a 2 car garage. The Residence Five- Starting from mid $500,000, 1,469 Square Feet, three Bedrooms, 3.5 Bathrooms and a two car garage. The Residence Six - Starting from mid $600,000, 1,669 Square Feet, three Bedrooms, 2 Bathrooms and two car garage. Lantana's Residences are detached three and four bedroom single family homes offering three different floor plans from 2,417 to 2,803 Square Feet. Home styles vary and include Tudor, French, California Bungalow, Craftsman, Colonial architecture. Kingston Residences are luxury townhomes ranging from 2,125 to 2,685 Square Feet. It is particularly unique in a geographical sense that part of Columbus Grove falls within City of Irvine and the other on the side of City of Tustin. Prices are more affordable comparing to Irvine homes yet close and able to use same amenities as Irvine such as the great. The District Shopping Center holding approximately one million square feet of open retail centers, stores, restaurants, movies, entertainment, grocery stores and much much more. The Irvine side is bonded by Warner, Barranca, Harvard and Peters. The Tustin side is bounded by Harvard, Warner, Moffett and Harvard. Irvine schools are Stone Creek Elementary School, South Lake Middle School and Woodbridge High School. 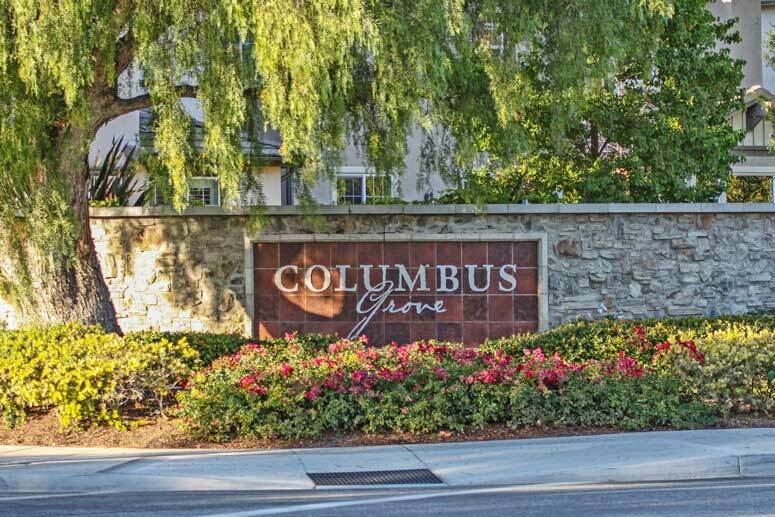 The Columbus Grove Master Association is managed by Merit Property Management located on 1 Polaris Way, Suite 100 Aliso Viejo, CA 92656. Their contact number is 949-448-6000. So please, have a look around, and contact us with any questions you might have about buying and leasing in Columbus Grove. No question is too mundane - we want to help!